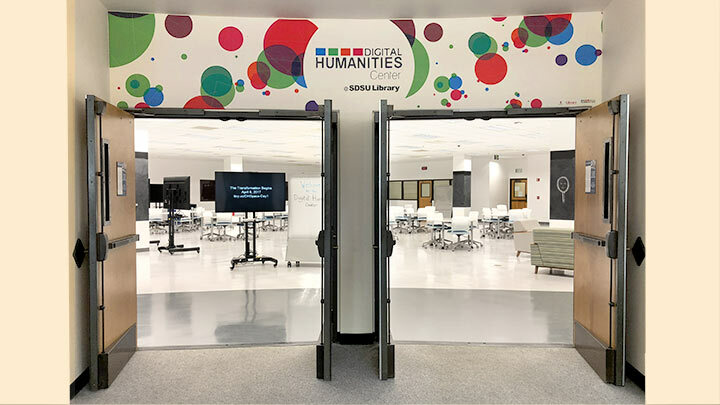 The Digital Humanities Center at San Diego State University Library (LA 61) is an interdisciplinary hub for the campus Digital Humanities Initiative and "Digital Humanities and Global Diversity" Area of Excellence. The center supports research, teaching, and learning that values the importance of the humanities, and the interactions of humans in real time and space, in the digital age. We welcome faculty, staff, students, and community members from across the disciplines and spanning the technological spectrum, from the skeptics, to the curious, to the consumers and producers/makers/civic hackers of digital technologies. We officially opened our doors during the Spring 2018 semester. Curious about the process of creating a DH Center? Follow our progress here. Interested in hosting a DH activity or event in our space? Please review our Usage Request Policy. Undergraduate and graduate students from across the disciplines are invited to fill out this brief survey to let us know what sort of skills you're interesting in acquiring. We can also connect you to students with similar or complimentary skills and interests to help you advance your digital project idea. The Digital Humanities Center is open 10am-4pm Monday through Friday most days during the academic year, except when there is a DH-sponsored activity. Our Activities & Events page lists upcoming public activities (private events and instruction sessions are typically not listed). Please also check the Library Hours Calendar for specific closures. Fill out this brief feedback form and help shape the ongoing design of the new Digital Humanities Center, as well as our future programming: http://tiny.cc/dhcenter-feedback. The DH Center is typically open when classes are in session (except during the summer) and when there are no formal DH-related activities scheduled. Please consult the Library Hours Calendar for specific closures. We can support a limited number of activities outside of our regular operating hours. We welcome a range of activities in our space, including scholarly talks and lectures, SDSU class visits, interactive workshops, showcases, and exhibits. We ask that all activities hosted in our space be open to the campus and, when appropriate, the broader public. Instruction requests should be made directly to the Digital Humanities Librarian: Dr. Pam Lach (plach AT sdsu DOT edu). See how our Digital Humanities Spaces operate and reserve a time.